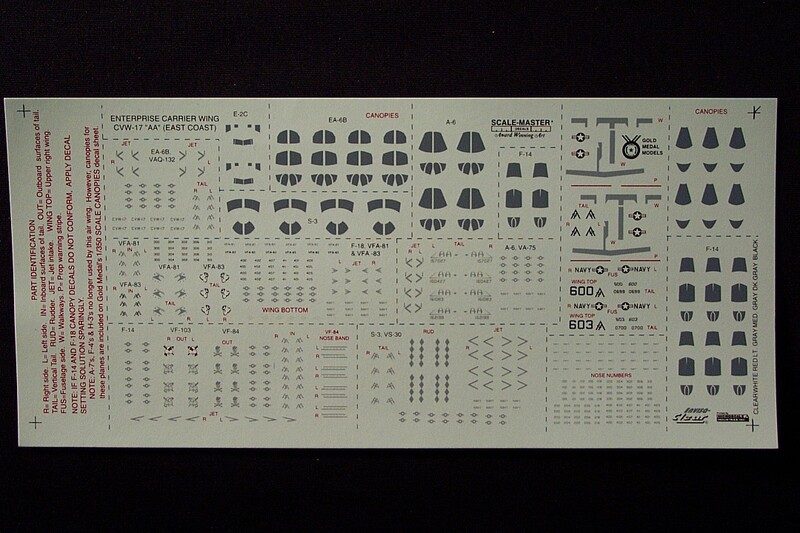 Five-color decal set (one sheet) that fits aircraft in Tamiya's 1/350 scale USS Enterprise kit (CVN-65.) Represents air wing markings as seen aboard the Enterprise since its transfer to the U.S. East Coast. Provides simulated canopies and squadron markings for 28 aircraft of six different types (four A-6, four EA-6B, two E-2C, eight F-14, six F-18, and four S-3.) Air Wing CVW-17 (tail code AA) includes markings for VAQ-132, VFA-81, VFA-83, VF-84, VF-103, VA-75, and VS-30. Also furnished are nose numbers, national insignia, nose and tail graphics, wing markings, "NAVY" graphics, intake warnings, and wingwalks for E2C aircraft. Simulated dark gray canopies eliminates the need for tedious hand-painting of aircraft canopies.